Selected 27th overall by Phoenix in the 2014 NBA Draft ... then was acquired alongside the 13th and 28th picks (Georgios Papagiannis and Skal Labissiere) and a future second-round choice by Sacramento in exchange for the eighth selection in the 2016 NBA Draft. Played the previous three seasons (2014-17) in Turkey for Fenerbahce where he led the team to both the Euro and Turkish League Championships in 2016-17 ... Averaged 14.6 ppg (.500 FG%, .430 3pt%, .855 FT%), 3.8 rpg, 3.6 apg and 1.12 spg in 27.9 mpg, in 22 games earning All-Euro League First-Team and Turkish Finals MVP honors ... Bogdanovic spent parts of four seasons (2011-14) with Partizan Belgrade, averaging 14.8 ppg (.401 FG%, .370 3pt%, .754 FT%), 3.7 rpg, 3.7 apg and 1.67 spg en route to 2013-14 Euro League Rising Star accolades ... At 21 years of age, he guided Partizan past rival Red Star Belgrade in the league’s championship series in route to posting 30.8 ppg, 4.8 rpg and 4.2 apg during the best-of-five series. 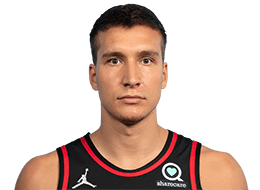 A member of the silver-medal winning Serbian national team in the 2016 Rio Olympics, Bogdanovic averaged 12.2 ppg, 3.6 rpg and 2.6 apg in eight contests, including a game-high 18 points (7-11 FG, 3-4 3pt, 1-1 FT) to accompany one rebound, five assists and three steals in a quarterfinal victory over Croatia ... Helped guide Serbia into the Games with averages of 17.8 ppg, 5.2 rpg and 6.0 apg during the 2016 FIBA Qualifying Tournament. Son of Dragan and Koviljka Bogdanovic.